So with limited food choices, I reached deep into my subconscious and remembered that a Korean restaurant on Kingsway is open until 2:00am. However, I didn't recall the name. Using streetview on my iPhone, I was able to show everyone the place. Problem was that the name had changed. While driving there, there was some a**hole that kept t ailgating me. Turns out it was Lionel Hutz. Yah, it was an a**hole alright. LOL... When we pulled up to the intersection of Willingdon and Moscrop, he took the right lane and I took the left turning bay. Polka King started throwing obscenities at him in jest; but the poor person between us thought it was real. They looked really scared... I guess they thought they were about to be the middleman in a road rage incident. We had a good laugh about that. By virtue of using the back road method, I arrived first. In all honesty, there was no rush since we were the only customers there... for the entirety of our meal. Joining us a little bit later were Milhouse and Special K. We had a bit of difficulty figuring what we were going to order since the menu had a decent selection. 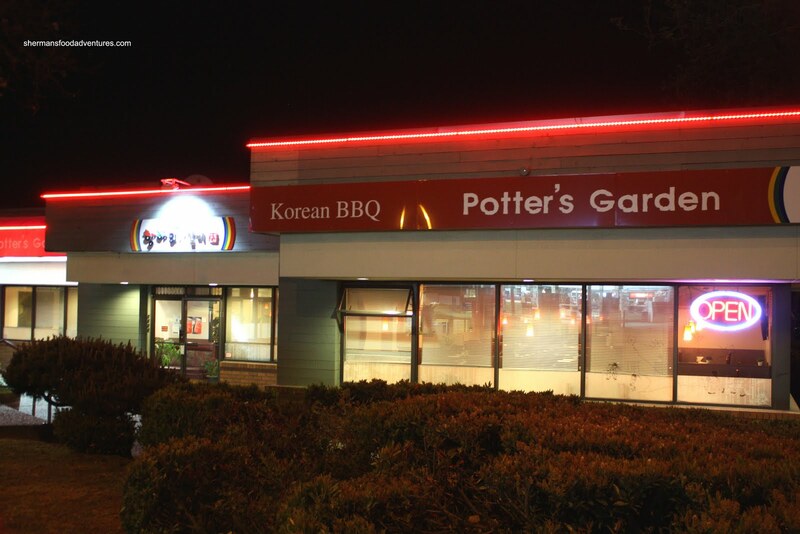 Furthermore, we weren't sure whether to go for one of their hot pots. At $40.00 for a large, we figured it would be too much food and too much money. However, most of their other items are moderately-priced. 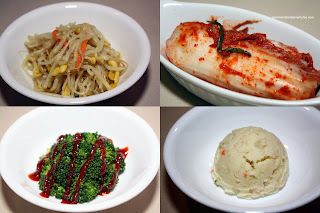 We started with the Banchan which included bean sprouts, kimchi, broccoli and mashed potato salad. We felt they were okay but not great. The one that we didn't like was the mashed potato salad. Texturally, it just wasn't easy to share or enjoy. Once again, we did ordered the "usual" starting with the Japchae. 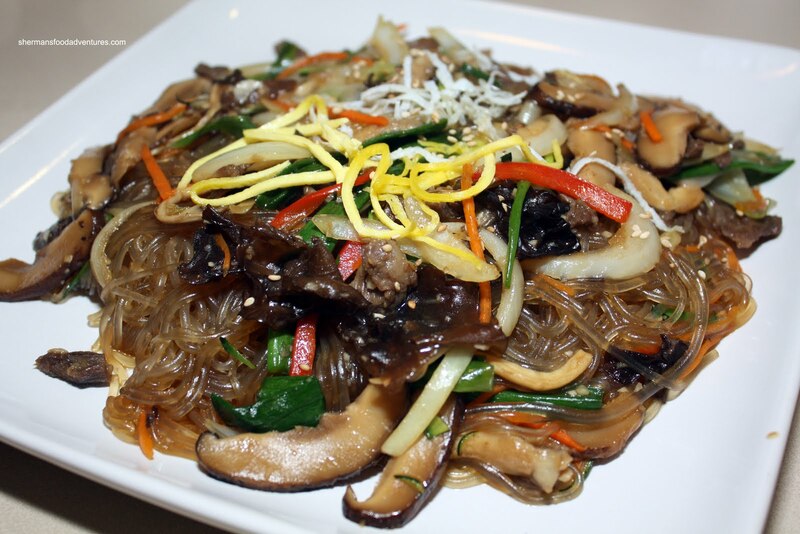 Packed with plenty of ingredients exhibiting a hint of sesame oil and sweetness, taste wise, this dish was a hit. However, the noodles were a bit clumpy. This is good and bad since that means there is less oil; but then again, the noodles should not be clumpy either. 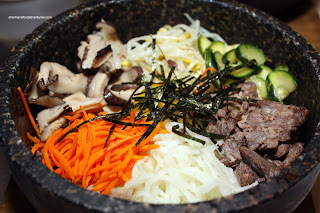 Continuing on our standard Korean dishes with the Dolset B ibimbap, we actually ordered two. 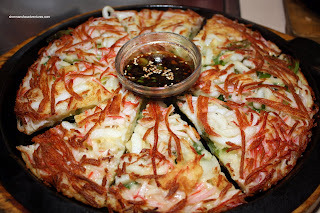 Arriving sizzling hot, I quickly took a picture and proceeded to mix in the kochujang. This dish was a winner with plenty of ingredients and properly cooked rice. I particularly liked the tender pieces of beef; rather than the ground beef that we sometimes see. Polka King was a bit resistant to the idea of ordering the Seafood Pancake since its generally quite greasy. Yes, it does usually give a Pizza Hut pan pizza a run for its money. However, in this case, it was only moderately oily on the bottom. I liked this pancake for it's crisp texture and fluffy interior. It's too bad that it lacked seafood. 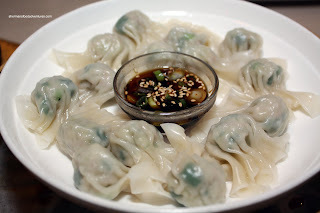 Oddly, the Jin Mandu (steamed dumplings) arrived last. These were pretty good with a predominantly green onion and pork filling. 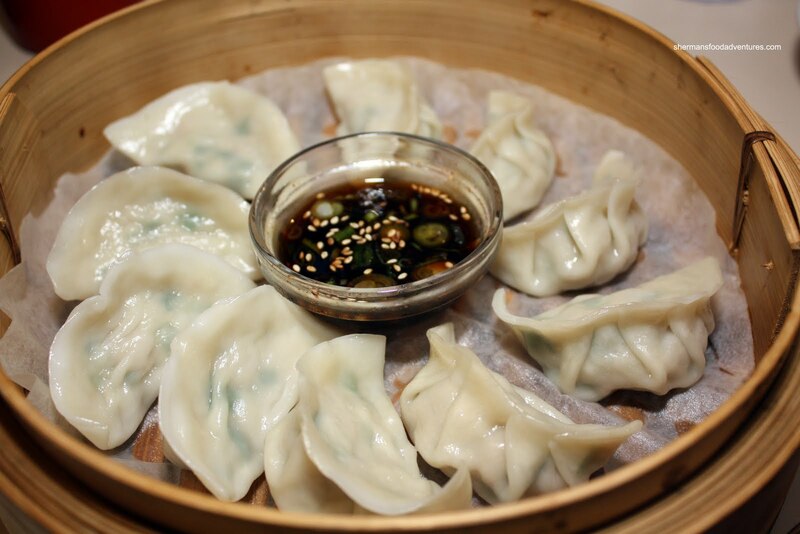 The dumpling skin was a bit on the dry and chewy side; but the dipping sauce helped alleviate that somewhat. After we got our order in, Emilicious showed up and that made me very happy. No, she wasn't wearing something provocative; rather, that meant another dish! Thanks to her, we got the Haemul Bokum Udon, which is fried udon with seafood and flying fish eggs. 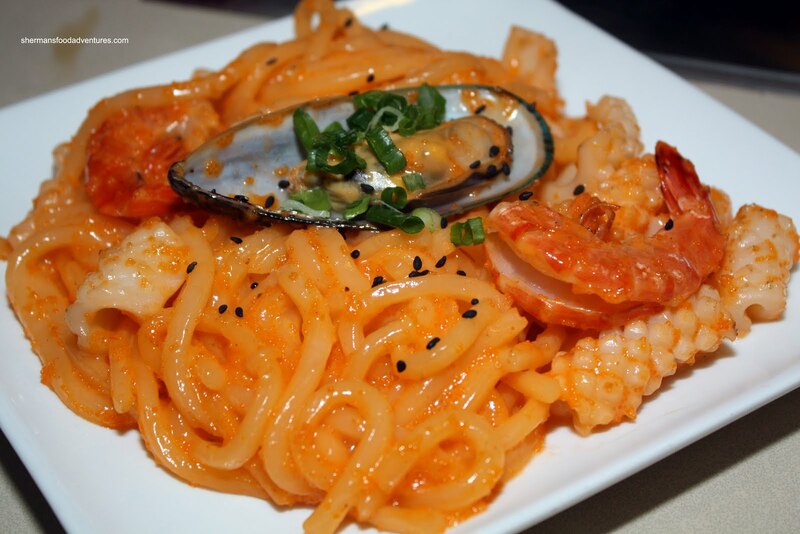 This dish reminded me of the one I had at Hapa Izakaya a while back. However, this one wasn't slimy or fishy tasting. Instead, it was sweet and full of seafood. I liked that the udon retained some chewiness. Now, for some reason or another, they brought out some complimentary Mul Mandu for us to try. Was it my camera? Very much like the other dumplings, these were smaller and boiled. Thus, the skin was softer. I like these more than the steamed ones. Overall, we were quite satisfied with the food here. It was strange to be the only table, although it was past 1:00am when we left. For me, I would return, probably a little bit earlier in the evening next time. At least Potter's Garden exterior looks more decent compared to Happy Day! 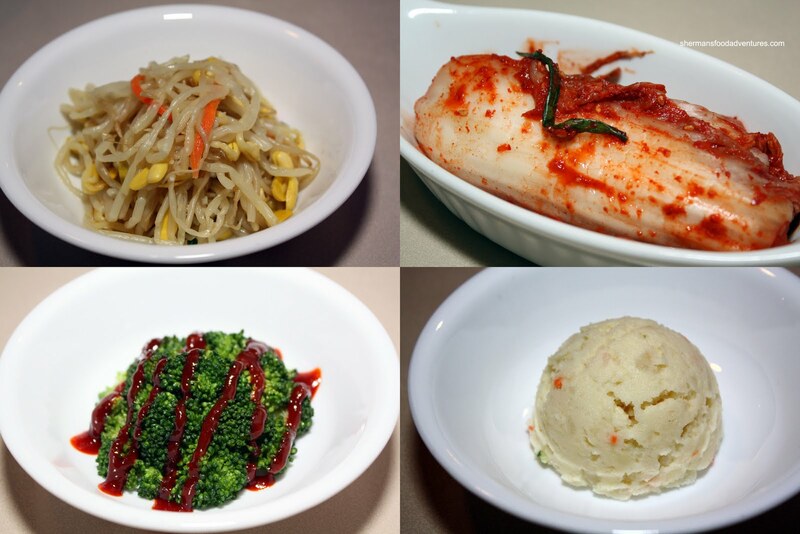 Most items are under $10, except for those really expensive hot pots. Yah, I hear ya, Korean food is pricey compared to other Asian cuisine. LOL! 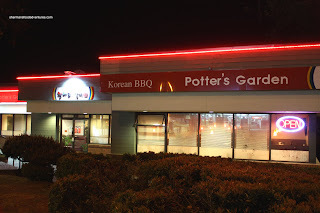 Too funny, I drove by this place last night and muttered out loud "Korean BBQ Potters Garden". The wife turned to me with a very confused look and we had a very brief conversation about what it would be like to have a bunch of pottery makers working around you as you ate. Yes, that makes little to no sense, but what a coincidence that I come to read your adventures and find the place written about. Then again, this isn't the first time.